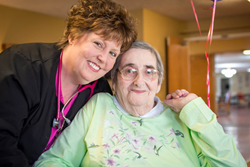 Signature HealthCARE embraces person-directed care in its culture and strategy. We knew it would take perseverance to see this vision come to life, and as a team, we began to fight for it with all we had. With the recent addition of Signature HealthCARE at Jackson County, Signature HealthCARE celebrates its 50th location to be named to the Eden Alternative Registry, a national list of certified culture change nursing homes. Seven years ago, Signature HealthCARE Quality of Life teams and executives decided to blaze the trail of culture change in the long-term care industry. "When we started this journey in 2011, the idea of the organizational transformation we would need to undergo seemed daunting at best. We knew it would take perseverance to see this vision come to life, and as a team we began to fight for it with all we had. We aligned every strategy to enhance and accelerate our person-directed care movement," Angie McAllister, Director of Cultural Transformation at Signature HealthCARE, said. The Eden Alternative Registry certifies health care facilities fully embracing person-directed care approach from the administrator to nurses to CNAs. The person-directed care approach transforms care by prioritizing a person's unique needs and particular wants in daily care and decision making. Signature HealthCARE is committed to continue leading the way in person-directed care, hoping to add even more locations to the Eden Registry. "We celebrate the fact that we have landed our 50th home on this journey with us," Angie McAllister said. "However, we also look to the future and realize we have so much yet to do. We are only getting started." Small changes mounting to transformations of stakeholders and elders is at the heart of person-directed care and Signature's purpose driven strategy towards the Eden Registry. Signature HealthCARE is a family-based healthcare company with integrated services at each point of the continuum of care. The company's organizational culture inspires more than 18,000 employees with three pillars: learning, spirituality and innovation. A growing number of Signature HealthCARE centers are earning five-star quality ratings, the highest classification from the Centers for Medicare & Medicaid Services, and 102 Signature HealthCARE locations earned QAPI accreditation. Inc. 5000 recognized Signature HealthCARE most recently on its 2017 list of fastest growing private companies.